You will remember that I recently created a mathematics lesson for my Instructional Practices for Math Teachers class. Later on in this course, I received an assignment to not just create a lesson plan, but also teach it and reflect on the experience! I had never taught a formal lesson before in my life! Rather than writing a whole new lesson plan, I decided to adapt the one I had already written, a literature integration. How do teaching experiences like this work when one is enrolled in an online class? The instructions clarified that if an elementary classroom was not available, one could teach the lesson to family or friends. But who wants to teach an elementary-geared math lesson to their parents and 20-something-year-old siblings? So, I planned to teach my math lesson to our neighbor’s children… only to find out that they were busy on the day I was planning for. What was I supposed to do then? … Of course! I would call the school where I substitute teach once a week and see if I could “borrow” a few of their students for 30 minutes out of a day. One of the administrative workers kindly emailed all the teachers for me, but I never heard anything back. I was sure they were just too busy to get back to me. So, I resigned myself to the idea of teaching a children’s math lesson to my adult family members. I did so, and it wasn’t as bad as I had expected–it was rather fun, and my family played along very nicely! The very next day I was called in to substitute teach. On a whim, I decided to bring the materials along for this lesson, and when I got the chance, I asked the teacher if I could present it to a few of her students. She told me I could present it to the whole class! Suddenly I had to think fast how I would adapt a lesson that had been planned for (at the most) 6 students to accommodate 23 students! But, I got my wish: For the very first time in my life, I taught a lesson in a real school to real students in a real classroom! One more step on the way to being a teacher! Here is my lesson plan. 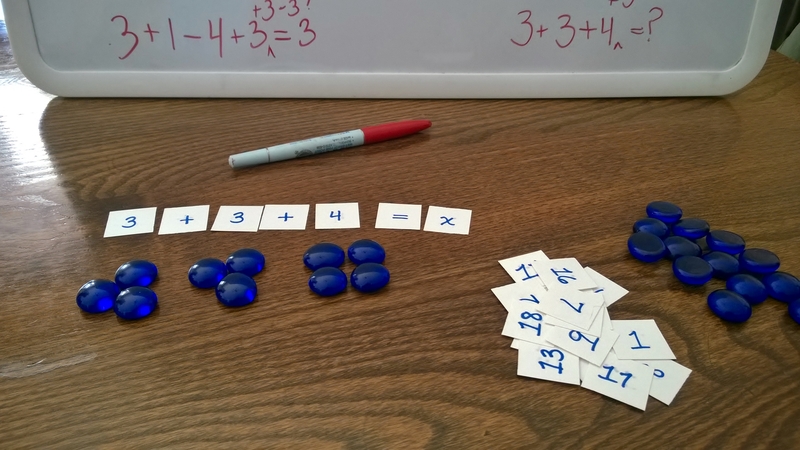 MN Math Standard: “Represent real-world situations involving addition and subtraction basic facts, using objects and number sentences” (Minnesota K-12 Academic Standards in Mathematics, 2007, 1.2.2.1). National Standard (NCTM): “Use addition and subtraction within 20 to solve word problems involving situations of adding to, taking from, putting together, taking apart, and comparing, with unknowns in all positions, e.g., by using objects, drawings, and equations with a symbol for the unknown number to represent the problem” (Grade 1 >> Operations and Algebraic Thinking, n.d., CCSS.Math.Content.1.OA.A.1). Objective: Given three examples of word problems, students will write equations for and correctly solve three other word/story problems involving addition and subtraction. Materials: “Blueberries for Sal” by Robert McCloskey. Marbles to serve as blueberries. 2 small containers for each student (or group), one to serve for Sal’s pail, and the other to serve for Sal’s mouth. A whiteboard. Blue washable marker. 1 set of loose number/operation sheets for each student (or group). Pencils. A worksheet with 3 word problems (+ bonus problem) for each child. Attention Getter: Give each student (or group) the two containers, one for Sal’s pail and the other for her mouth. 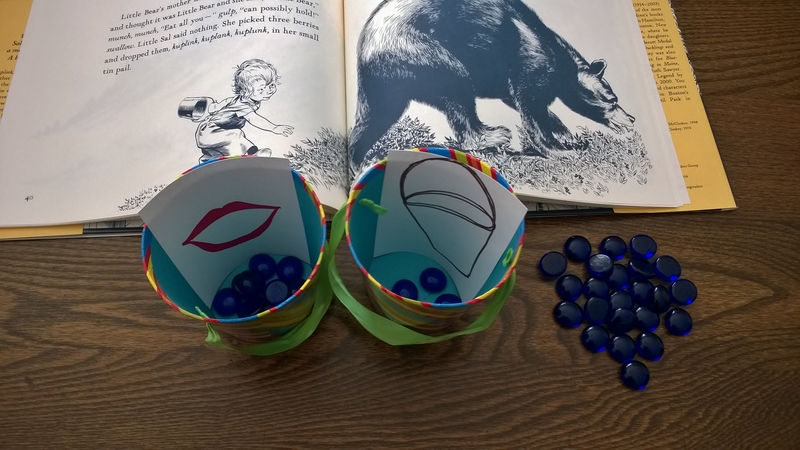 Read “Blueberries for Sal.” Have the students follow the story closely, placing the marbles in the correct containers as Sal picks the blueberries and then puts them in her pail, eats them, or both. At the end, we will see if any group has gotten the correct number of blueberries in each container. Instruction: Explain the objective of translating story problems into equations and solving them. Talk about why this is important. Talk about what an equation is (how to identify it). (Equations have numbers and an “equals” sign. One side must be equal to the other side to be true.) Go over the story again, writing up each sentence on the board that pertains to our equations. -Sal picked 3 berries and dropped them in her pail (p. 8). -She picked 3 more berries and ate them (p. 9). -She picked more (4?) berries and dropped one in the pail. The rest she ate (p. 9). -Then Sal ate all 4 berries out of her pail (p. 9). -She picked 3 berries and dropped them into her pail (p. 40). -Sal only had 3 berries left in her pail when she went home (p. 55). 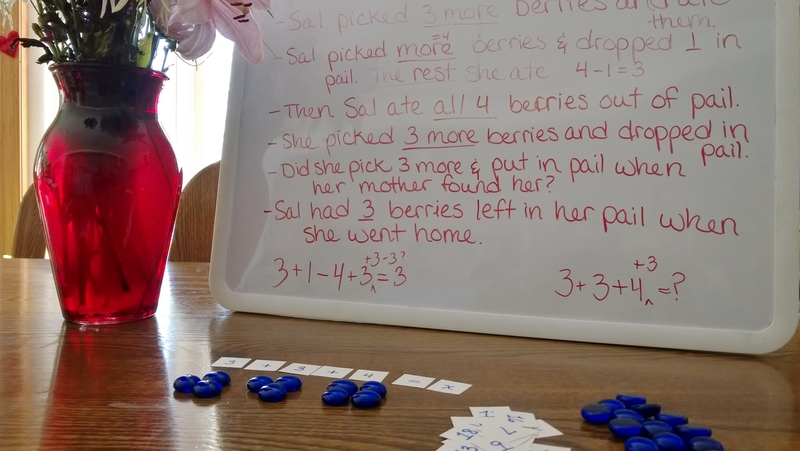 Then, using the marbles and the whiteboard, I will create two equations (“Blueberries eaten” and “Blueberries in Sal’s pail”) that match the story. 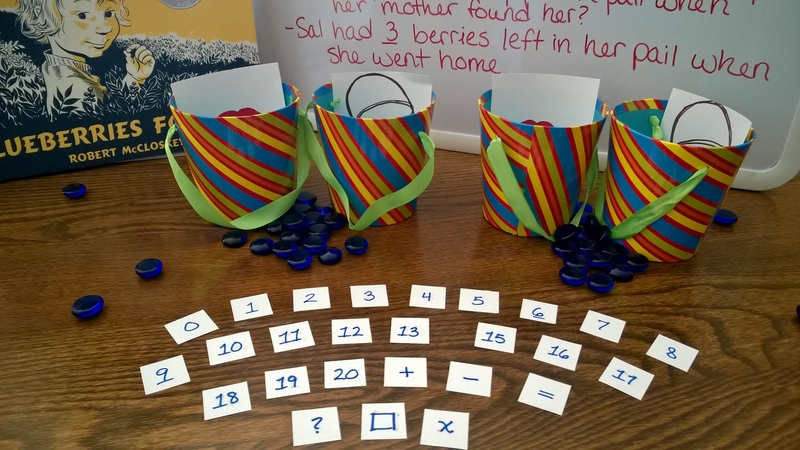 Guided Practice: Write the numbers 0 – 10 and multiple +’s and –’s on both sides of little 1 sq. in. pieces of cardstock. Divide students into groups of two or three. Give students word problems (written out on the whiteboard) based on the story that they must create equations to match and solve using the number/operation manipulative (and marbles, if needed). I will assist the students in figuring out the answers. -If Sal’s mother put 5 berries into her own pail, added another 5 berries, and then Little Bear came along and ate a mouthful of 5 berries, how many berries would she have left in her pail? A: 5 + 5 – 5 = ? ; 10 – 5 = ? ; 5 = ? Independent Practice: Students will be given a short worksheet with 3 word problems like those done in guided practice, which they must write equations for and solve. They may use the manipulatives, but this time they will write the answer in pencil on the worksheet. Closure: Go over the correct answers* for the worksheets, me writing the answers up on the board and explaining why they are correct, and the students checking their work against the answers I put up. We will then discuss why it is important to know how to convert a word problem into an equation that can be solved—I will ask the students to think of some everyday experiences where they might encounter problems like this. 3. n – 2 – 3 = ? ; 9 – 2 – 3 = ? ; 7 – 3 = ? ; 4 = ? Bonus: 3 + 3 + more(4?) + 3 = 13 berries (you count only the ones she picked—you cannot count the ones she’s transferred from her pail to her mouth; they were already picked). –Learning Styles (modalities/multiple intelligences): This lesson includes visual aids (marbles, number/operation cutouts) for visual and kinesthetic learners, a story for auditory learners, and discussion for linguistic learners. 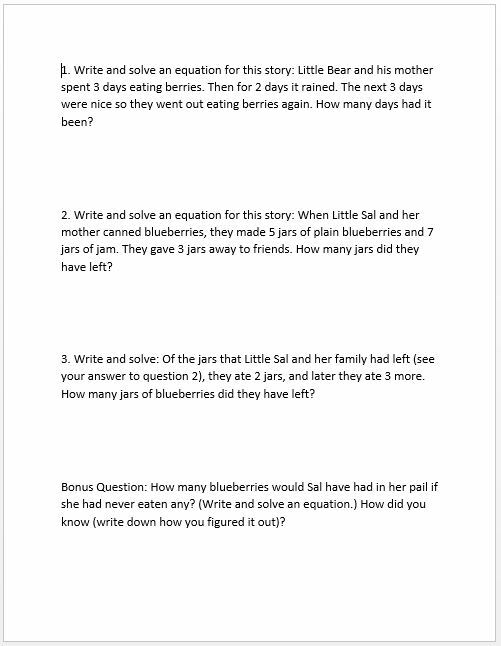 –Gifted: For those students who finish their independent practice early, there will be this challenge question they can try: “Write and solve an equation showing how many blueberries would Sal have had if she had not eaten any.” They may work with the marbles as well as the number/operation manipulatives. –LEP (limited English proficiency): This lessons contains an explanation of what equations are. –LD (learning disability), ED (emotional disability), ADD (attention deficit disorder): This lesson is contains a captivating story and switches periodically from one activity and medium to another. This will help those who have ADD to keep from getting bored and ancy. I will explain to the students that it’s ok if they make mistakes—that’s how they will learn, so if those with LD’s don’t get the right answer, that’s ok. Those with ED should find no occasion in the cheery, fun story and the upbeat lesson to experience hardships. There will be nothing condemnatory. I will call on all children equally, thus avoiding hurt feelings, and will never lavishly praise one child because they got the answer “right,” but will prod even the “right” child for more explanation on how their thinking led them to the right answer, thus improving the understanding of the whole class, and not singling any one child out as gifted or another as incapable. –Multicultural Connections: If there are cultural diversities in my classroom, I will bring a picture of blueberries to show, and ask those in the class who have eaten blueberries to raise their hands. I will also explain that most people today buy blueberries in the store, but that in our story the mother and daughter go out to a mountainside to pick wild blueberries. Evaluation/Assessment: The answers to the worksheet, as well as the students’ answers to my questions during instruction and guided practice, will show if they understand the concept of creating and solving equations from word problems. My professor gave me a 98% grade. 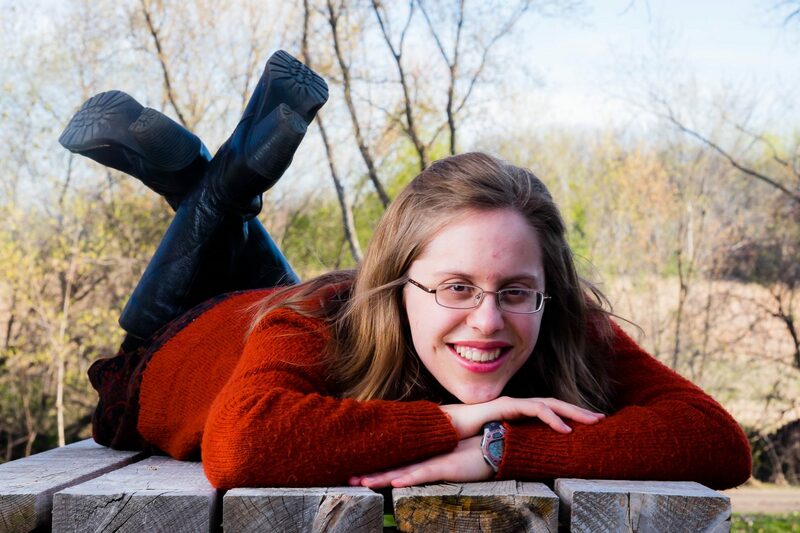 She explained that she would have liked a better hook for an attention getter–a one-line statement or brief action that could have immediately captured the students’ attention even before I began reading the story. She also pointed out that I need better differentiations for learning disabilities [the lesson on differentiation came a week after this assignment was completed]. Tomorrow I will share with you how I ended up actually teaching my very first math lesson (both times)–things never go as planned–as well as my reflection of the experience(s)! Stay tuned! Previous PostPrevious The Finish is in Sight!